If you are a busy parent, or just a busy person, you have discovered you must take advantage of little bits of time when you find it. For instance, I've been known to pray the rosary while waiting in car pool, write thank you notes while at my child's swim practice and as you learned recently, sit on my kitchen floor for a 3-Minute Retreat. Recently, while having a discussion with my kids on praying daily, I shared with them the place I probably pray the most - my shower. After laughing hysterically at me, they told me it was a silly and strange place to pray. To me, its perfectly logical. I'm alone and quiet. Its early in the day, so I don't have a lot clouding my thoughts yet. Years ago, as a lawyer, I did my best case analysis and strategy in the shower. 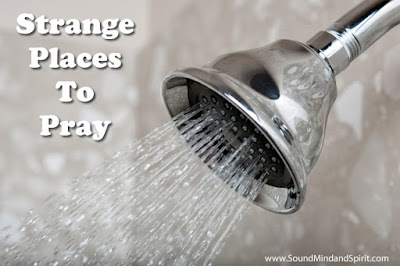 Now, most days, I find myself in prayer while getting clean. What about you? Do you take advantage of quiet time when and where you find it? Where do you find yourself speaking and listening to the Lord?